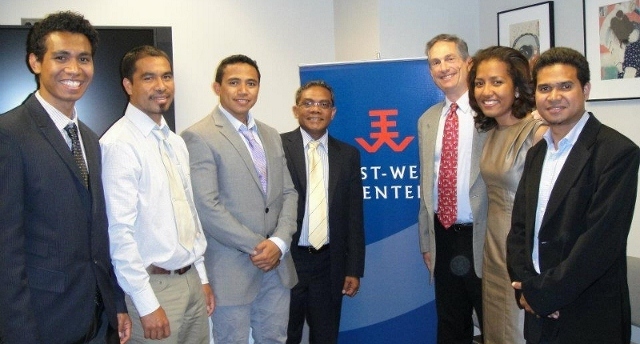 (Click to Enlarge) Timor-Leste's ambassador to the US, Constancio Pinto, was among the dignitaries who met the USSP/USTL scholarship students at an evening reception at the East-West Center in Washington. WASHINGTON, DC (May 31, 2012) – Nine student recipients of the U.S.-South Pacific (USSP) and the U.S.-Timor-Leste (USTL) Scholarship Programs were honored at a reception hosted at the East-West Center in Washington. These scholarship programs assist students from the island nations of the South Pacific and Timor-Leste who are pursuing degrees degree at universities in the United States in various fields that allow them to develop leadership qualities and skills that will contribute to the human capacity and development of their respective countries. They are funded by the U.S. Department of State’s Bureau of Educational and Cultural Affairs (ECA) and administered by the East-West Center (EWC) in Honolulu, Hawaii. Representing four nations, Fiji, Papua New Guinea, Timor-Leste, and Tonga, each of these remarkable students are perusing undergraduate degrees at the University of Hawaii. They were in Washington DC to participate in a five-week summer internship, a required portion of their scholarship, where they received a professional appointment in an organization or government agency that is engaged in work related to their major fields of study. During their stay, the USSP and USTL students also participate in cultural trips and activities. (Click to Enlarge) USSP students with group coordinator Gene Vricella, and his wife, Professor Jill Robinson. This group of nine students was led by Mr. Gene Vricella, Scholarship Program Coordinator with the Education Program at the East-West Center. Also attending the reception were some of the students' supervisors in Washington D.C., representatives of Pacific nation embassies, representatives of the State Department and EWC alumni from the Washington, D.C. chapter.